Waterproof Rice May Help Asia Cope with Flooding In Bangladesh, rice is the daily food for everyone. A genetically engineered strain of the crop is offering hope for surviving the long-lasting floods that are a product of climate change. 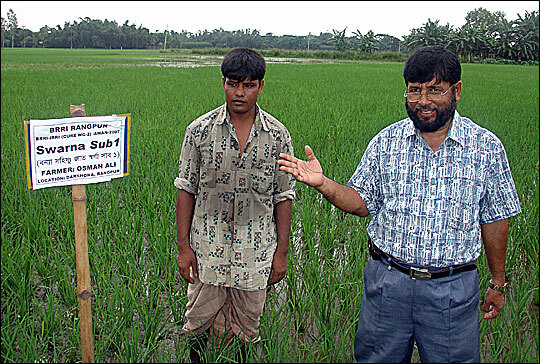 Dr. Md Abdul Mazid, of the Bangladesh Rice Research Institute, stands in a field of flood-resistant rice. Nalitchandra Barman, a 70-year-old farmer, remembers eating banana leaves to survive after monsoon rains drowned the rice crop. 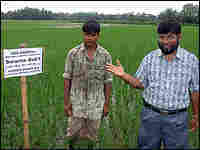 Farmer Osman Ali tends to his flood-resistant rice fields. 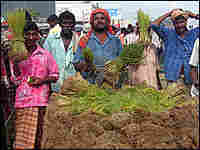 Men sell rice seedlings along a highway. 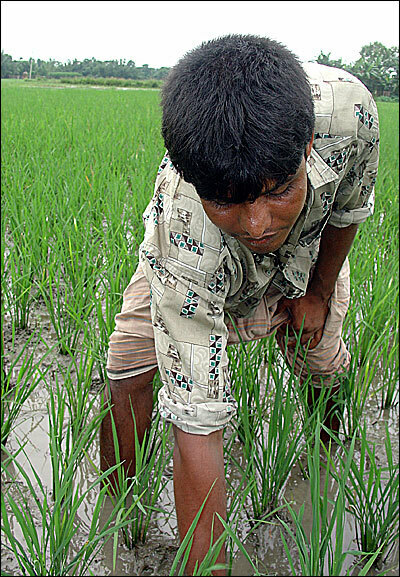 Rice is an important staple in Bangladesh. 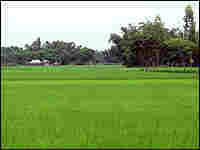 Rice fields dominate the landscape in Bangladesh. In Asia, about 3 billion people depend on rice to survive. The grain provides calories and propels local economies. In many places, it dominates both the landscape and the culture. 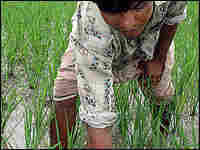 But the rice fields of Asia are in danger from the extreme weather associated with climate change. Too much rain, or too little, can destroy a rice harvest. And the weather in Asia this year has been ferocious. Monsoon rains have inundated countries from the Philippines to Nepal. Super typhoons slammed into China and Japan. And a heat wave in Pakistan pushed the temperature to 125 degrees Fahrenheit. All of this is bad for rice. And what's bad for rice is especially bad for Bangladesh. The people of Bangladesh get about two-thirds of their total calories from rice. In the capital, Dhaka, food markets are divided into two major areas: fish and rice. At the Kawran Bazaar, a line of burlap sacks overflow with rice. The cheap stuff is coarse and brown. Upscale rice is fine, white and polished. Shamim Ahmed, a customer at the market, is eager to talk about the significance of rice. "Rice is daily food for everyone, from poor to rich. It's one of the essential things, like salt," he says. Ahmed also says that when the rice crops fail, people starve, like after the great floods of 1974. "That year, nearly all the places got submerged and that is why there [was] no rice production, and people had no work, so a lot of people died." In fact, nearly a million people died. Since then, scientists have been trying to create rice that survives flooding. About 2,000 miles away in the Philippines, Bob Zeigler is the director of the International Rice Research Institute. He's a plant pathologist who started out in the Peace Corps. To him, rice is a powerful engine that can drive away hunger, malnutrition and poverty. But not if it's underwater. 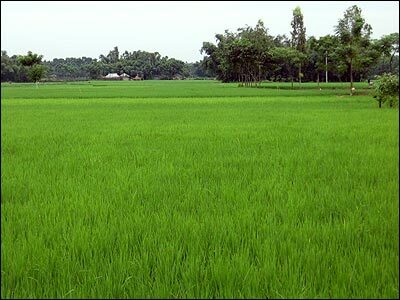 "Even a crop like rice, which grows in standing water, cannot stand to be totally submerged. It'll drown like any other plant," Zeigler says. That usually takes just three or four days. But scientists at the International Rice Research Institute have discovered a gene that lets rice essentially "hold its breath" for up to two weeks. It's called the submergence 1 gene — sub-1 for short. Dave Mackill led the team that discovered the gene. 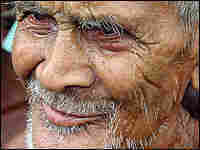 He walks along an earthen levee that separates two rice fields, each about the size of a tennis court. On the left is a field planted with rice carrying the sub-1 gene. "It looks pretty much like a normal crop. This field was under submergence for 12 days," Mackill says. And despite its prolonged submersion, it's thick with brilliant emerald stalks that are nearly waist-high. 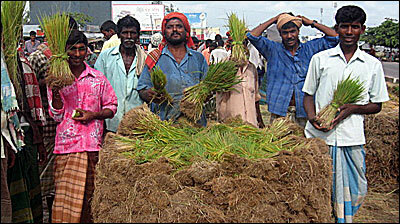 The paddy on the right was also submerged for 12 days. The rice there is patchy and stunted. It's the exact same variety, but without the sub-1 gene. Zeigler says that rice plants with the flood-resistance gene have huge potential in places like Bangladesh. "If they produce the way we expect they will, it will be a massive impact in that part of the world. I mean it will be a spectacular demonstration of the power of science to make a difference in people's lives." But that effect will occur only if the new rice does as well in the real world as it has in the institute's carefully groomed paddies. And it doesn't get any more real than northern Bangladesh, where the vast Brahmaputra River often spills over its banks and into the fields of struggling rice farmers. Gobindra Chandra Rai is a farmer whose field had been under water just a few weeks earlier. He says that when the floods came, the whole area was submerged up to about waist high. The government gave farmers in Gobindra's village seedlings with the flood-resistance gene, but most hadn't planted them in time. When the monsoon floods came early, Gobindra was the only one that had. So he and his neighbors watched Gobindra's field anxiously. The field was under water for eight days. Gobindra says that usually after eight days, the crop would be damaged. But the sub-1 rice is still thriving. He tends to it carefully. If a stalk is leaning, he straightens it. If a leaf is muddy, he squeezes it clean between two wet fingers. Gobindra says his neighbors are amazed by what they've seen in his paddy. Standing in a semi-circle in front of a shed made of bamboo and corrugated sheet metal, they line up to talk about Gobindra's rice. Men stand up front. Women farther back. And little boys climb on anything tall enough to give them a better look. Many of the farmers can't read or write. But when it comes to rice science, they're at the cutting edge. And every single one in Gobindra's village now plans on planting the sub-1 variety. The farmers also know something about the power of weather. 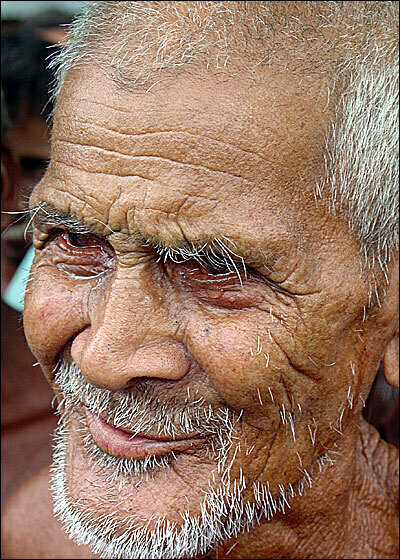 Nalitchandra Barman, 70, remembers living on banana leaves when monsoon rains drowned the rice crop, and he worries that the rains are becoming more and more unpredictable. "The current situation is when they expect rain, they don't get rain. And during the drought season, they get rain. So the whole climate, it changed totally," Barman says. Flooding isn't the only change associated with global warming. There's also the prospect of more severe droughts. And as sea levels rise, salt water will leak into the rice fields near the coast. Scientists in the Philippines are trying to find genes to solve these problems, too. The villagers try to explain what all these threats mean to them. One villager says, "Rice is the main food of our country. Without rice we cannot live." For some, they just can't imagine anything else. It's hard to think of a food that matters more — to more people — than rice. Although it is grown in more than 100 countries, roughly 90 percent of all the rice in the world is consumed in Asia -– much of it in China, India and Vietnam. The countries that consume the most rice generally produce it themselves. According to the Cambridge World History of Food, less than 5 percent of the world's rice enters the world market. The crop also plays an important role in many poor countries' economies, employing several hundred million people in rural areas throughout the world. It's far from a complete source of nutrition. Rod Wing, a professor of agricultural and plant science at the University of Arizona, notes that it lacks many important vitamins and minerals. But as a simple and copious crop, it still shows up in billions of Asians' bowls for every meal of the day. By some estimates, rice cultivation dates as far back as 10,000 years, when growing techniques are believed to have spread throughout tropical regions of south and southeast Asia. That history has allowed a special consciousness about this food staple to sink into many Asian societies — and languages. In Japanese, the word for "steamed rice," gohan, is the same as the word "meal." And in China and Korea, where elders recall times when food was hard to come by, some still greet each other with the question, "Have you had your rice today?" It was on a country road in the Philippines 10 years ago, that Rod Wing learned just how much rice matters to the people of Asia. It was not long after harvest time and the fresh grains had been laid out to dry on burlap sacks along the roadside. Wing and his colleagues spied a huge family — 30 relatives strong — tending to the crammed plot of land that held their crops and their small home. As an agriculture professor, Wing knew that rice was — and had been, for centuries — the main source of nutrition for Asia's rural poor. But as he walked into the family's field, watching them harvest each stalk by hand, he caught a glimpse of rice as culture. "Basically, they spend their entire life growing rice to eat," he said. "In these really poor countries, that's their job, that's their life's work."